In the decades of the 1920s and 1930s in the section of New York City known as Harlem, there developed a unique awakening of mind and spirit, of race consciousness and artistic advancement. This declaration of African-American independence became known as the Harlem Renaissance. Stemming from the Great Migration when large numbers of blacks living in the rural South made their way to the urban centers of the North and Midwest, it was marked by an emergence of new ideas in political thought; numerous groundbreaking artistic developments in theater, music, literature, and visual arts; and an inauguration of civil rights organizations, unions, and other associations. Encyclopedia of the Harlem Renaissance is a fascinating guide to this colorful and culturally productive era in African-American history. Including a foreword by Dr. Clement Alexander Price, an esteemed scholar and the current director of the Institute on Ethnicity, Culture, and the Modern Experience at Rutgers University; a general introduction; A-to-Z entries; a chronology; a glossary of slang; a bibliography and list of sources for further reading, listening, and viewing; a subject index; and a general index, this encyclopedia contains an abundance of information presented in an accessible format that everyone can enjoy. 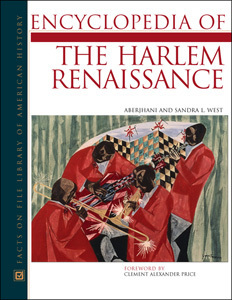 "This comprehensive, information-packed encyclopedia is an interesting guide to the artistic and cultural movement known as the Harlem Renaissance...reader-friendly...impressive...Recommended." "Encyclopedia of the Harlem Renaissance takes an important look at one of the great artistic periods in the history of the United States...Encyclopedia of the Harlem Renaissance is indeed an important work. Aberjhani and West should be commended for their efforts to bring this history to the public." "This meticulously cross-referenced volume will provide the serious student or special interest classroom with a wealth of information about this fascinating period of American history...such a thorough and well-researched book...[a] capable resource for collections that have a high demand for information about this juncture in American history." "...lengthy, invigorating, informative, and challenging essays...indispensable...An excellent and inspiring work of scholarship...Essential." "Celebrate Harlem's past and present with Encyclopedia of the Harlem Renaissance..."
"...scholarly yet highly readable...a very lively read...Encyclopedia of the Harlem Renaissance is no doubt one of the most spectacular and important works by a local writer in a long, long time..."
"The volume is liberally filled with photos and graphics that bring the time period to life...this is a fine resource—one could read it like a book, from cover to cover. Recommended for high-school, public, and academic libraries." "...a fascinating guide to a colorful and culturally productive era in African-American history." "...[a] nicely illustrated collection...This promises to be a frequently thumbed resource...Recommended for collections and libraries touching American or African American history and culture." "...provides a wealth of information...The entries are clear, concise, and alphabetized, thereby making this reference source easy to use. Additionally, this is a thorough and rigorously comprehensive work...surprising and refreshing details...[a] useful text...This book is an enjoyable read." "...an outstanding reference resource and is highly recommended for libraries of all sizes."